We are Louisiana’s most gentle and complete wildlife service! A All Animal Control is your local wildlife experts and are commonly called upon to control Armadillo, Bats, Birds, Beaver, Brazilian Free-tail Bats, Cats, Cottonmouth Snakes, Copperhead Snakes, Coyotes, Chimney Swifts, Deer, Flying Squirrels, Fox Squirrels, Fox, Geese, Groundhogs, Mice, Moles, Muskrat, Nutria, Nutria Rats, Pigeons, Rabbits, Raccoons, Rattlesnakes, Rats, Skunks, Snakes, Squirrels, Sparrows, Starlings, Turtles and Woodpeckers. A All Animal Control of Southwest Louisiana is the most humane and gentle wildlife control service available in Sulphur and Lake Charles in the Southwest Louisiana area. We are devoted to preserving the balance between people and nature. Proudly serving the Parishes of Beauregard, Calcasieu, Jefferson Davis and Cameron of Louisiana and surrounding communities. We also service the settlements, cities and towns of De Ridder, Merryville, Carlyss, DeQuincy, Iowa, Lake Charles, Moss Bluff, Prien, Sulphur, Vinton, Westlake, Cameron, Hackberry, Oak Grove, Elton, Fenton, Jennings, Lake Arthur, Welsh and Beauregard, Calcasieu, Jefferson Davis and Cameron Parishes of Louisiana. The Parishes that A All Animal Control of Southwest Louisiana services are Beauregard, Calcasieu, Jefferson Davis and Cameron Parishes of Louisiana. A All Animal Control, a Nuisance Wildlife Management company is a leader in providing wildlife, animal and pest control services for residential, industrial and commercial clients in Southwest Louisiana and surrounding communities. We can handle any wildlife control problem from mice to deer and provide incredible service while using the latest technology and equipment. To control wildlife requires a qualified and experienced expert to assure you of expert care of your wildlife problem. A All Animal Control provides the Southwest Louisiana area with the most humane and gentle technicians available anywhere. Your wildlife expert has been specially trained in the control of wildlife specific to Southwest Louisiana area and will take care of the problem in the most gentle and humane way possible. All wildlife experts of A All Animal Control undergo a rigorous training program for wildlife control in order to give you the most efficient and cost effective solution to your problem. Their wildlife professionals are licensed and insured for your protection and comply with all laws regarding wildlife control. A wildlife expert is just a phone call away and can often assist with your Southwest Louisiana wildlife control needs the very same day. Call us at 337-660-6547 to put an end to that annoying wildlife problem and control damage wildlife causes. A raccoon, skunk, snake, opossum, or cat in an attic can destroy the insulation and leave disease infested waste behind. An animal in an attic may also enter the home and put the occupants at risk of being bitten. Bird and pigeon control are services we provide through installing bird spikes, bird netting and bird exclusion. Pigeon trapping using pigeon traps and mist netting is also available. A mist net is a fine mesh net used to capture smaller birds such as birds in a store. Companies like Orkin and Terminix control insects. If you need a professional to control your wildlife problem, our specially trained technicians will quickly resolve the situation. 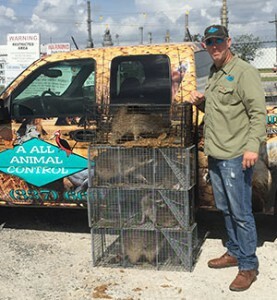 A All Animal Control of Southwest Louisiana offers Lake Charles squirrel control, Lake Charles raccoon removal and control are services that we provide daily as well as Lake Charles armadillo control, Lake Charles bat control, Lake Charles snake control, and Lake Charles opossum control and removal. We are the most humane squirrel removal option in the Southwest Louisiana area. A wild critter pest must be controlled using the proper elimination, eradication or critter capture techniques. In most cases we can relocate the wild animal and do not have to kill it. There are occasions when the animal must be exterminated by wild animal services. In such cases, we use proper extermination techniques recommended by the American Veterinary Medical Association or AVMA, making us the most humane and gentle choice for wildlife control in the Southwest Louisiana area. The use of a moth ball or other repellants often fails during the removal process and is not a legal repellant for wildlife. We often find moth balls in the attic or crawl space in use to cover a dead animal odor or smell and the owner is trying to use them as an animal remover product. Dead animal removal and odor control are services we offer for such unpleasant situations in addition to animal exterminating, offering the expertise of a skunk odor professional. A professional knows how to catch and release the captive animal. Once caught, they must abide by their local wildlife laws. A All Animal Control of Southwest Louisiana is the most humane and gentle wildlife control service in the Sulphur / Lake Charles area. Raccoon, Skunk, and Squirrel removal from a crawlspace or attic is a common problem in the Beauregard, Calcasieu, Jefferson Davis, Cameron Parishes and Southwest Louisiana area. We can remove a Raccoon and Opossum and Possum from a crawlspace quickly and repair the damage to your crawlspace. We will also install a new crawlspace door to prevent any future problems. Catching animals or rodents in a crawl space, gutter, or vent are other services pest control companies provide. A pest control contractor can trap an animal and provide local pest control as well as wild animal control. For your Southwest Louisiana Animal Control needs, call us at 337-660-6547.